This was taken a few days after Adam was born and while an election campaign was in full swing. 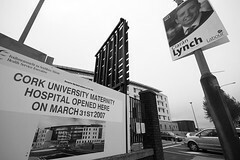 Outside Cork University Hospital a proud poster announced that Cork University Maternity Hospital opened on March 31st. I can't remember if it did, or was it a week later, but some smart arse added "Despite the best efforts of the HSE" above the main message. 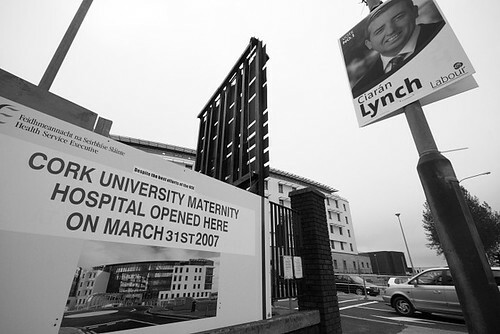 An obvious reference to the bullying tactics employed to get midwifes to work in the new an under-staffed hospital. Oh, hi to Ciaran Lynch too!